Today’s episode includes an interview with Kim Ades, president and founder of Frame of Mind Coaching. 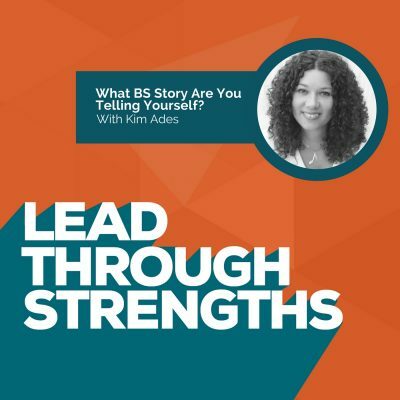 You’ll get some insights about how your strengths come out (or get hidden) based on your mindset. She also helps you see how your ability to thrive in your strengths is shaped by the way you’re interpreting the world. You’ll learn several different tools to help you move beyond your current way of looking at the world around you. These ideas move you toward a life that’s not as limited by your internal biases and traditional thought patterns. Notice What Works To Get More Of What Works. Kim says that to find what you are really good at, you need to look at all the clues around you. Look at when you are actually in the zone. This is when you are at your highest peak, focused, putting forth your best effort, and highly productive. In other words, look at where you’re enjoying yourself! Write It Down. She highly recommends journaling for several reasons: 1) it shows you how how your thinking impacts your results over time 2) it gives you a sense of how you react over a series of circumstances so you can spot your patterns of behavior that aren’t obvious to you, 3) journaling helps you to separate you from your thoughts. Kim stresses that we are not our thoughts; thoughts are things that momentarily pass us by. Looking at things from a distance gives you a better perspective. Get Clear On Your Triggers. Understanding your patterns of behavior in certain circumstances will enable you to see things that trigger your default responses. Decide How To Respond. The behaviors of others that trigger strong responses in you can lead to judgments about things that may or may not be true. If you know your triggers in advance you can decide what you’re letting them mean to you. Do Something With The Trends. It’s important to look back at your journal entries to find your patterns and triggers so that you can limit your judgments that interfere with team success. Kim has a surprise for those who listen to the show. She poses three questions during the interview. If you submit the answers to Kim, she’ll assign one of her coaches to review insights about your answers by phone. How cool is that? Answering these questions will help you explore what’s getting in the way of you reaching your goals. She also offers a gratis copy of her ebook, What You Focus On Grows, through her website. This book will guide you through the steps to see your moments that create ease vs. the ones that create tension. You’ll learn what you want more or less of. This aligns perfectly with the StrengthsFinder work we do at Lead Through Strengths. Here’s an activity in great alignment: In our strengths-based version, we ask you to list your Yucks and Yays when you look at your calendar and To Do list for your upcoming week. Then you ask yourself which of your StrengthsFinder talent themes might be getting starved (or fed) by each those activities. From there, you can narrow down your “More Of” list and your “Less Of” list so that you can create specific action plans that nurture your natural talents. The last thing Lisa and Kim address in this interview is values, both the values you live and the values you’d like to incorporate. They are two different categories. Kim believes that your highest values always come with contradictory consequences. For example, take an employee who sees a teammate not finishing his part of a project. She jumps in to finish it because she makes the assumption that no one else will. She also assumes her customers would otherwise suffer because the product wouldn’t go to market. Her value of taking care of customers is important, yet adding these tasks to her already packed workload will hinder her overall performance (and therefore customer satisfaction). Can you see an example like this in your life? Do you have a belief that no one else will jump in when a ball is dropped? If yes, are you showing a lack of faith in your team? This is an example we see in our StrengthsFinder training as well. Often someone who leads with the Responsibility talent theme will take on extra work to save a project, only to find himself drowning and struggling to meet deadlines because of the extra workload. This vicious cycle leads to burnout, or it makes you feel like your values are getting nurtured and insulted at the same time. To understand what your values and beliefs really are, ask yourself two questions: 1) What do I believe to be true about myself? 2) Is it the absolute truth? The answer to the second question will help you create a little wiggle room. That way you can question some of the assumptions you’re making and spot patterns in your thinking that you want to change.